As I’ve mentioned before in my Gold Coin Necklace and Teardrop Earring blog posts, I bought €296 worth of jewellery from Monsoon/Accessorize for €11 because all the items were broken or missing pieces. I’m slowing working my way through the more challenging repairs, such as repairing and reinventing tangled brass/glass necklaces. 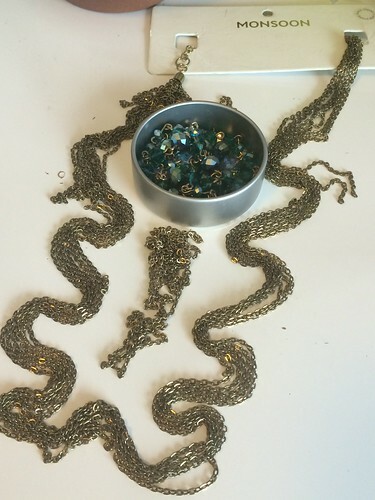 The five Albany necklaces were so badly tangled, I had to disassemble them to even do anything with them. 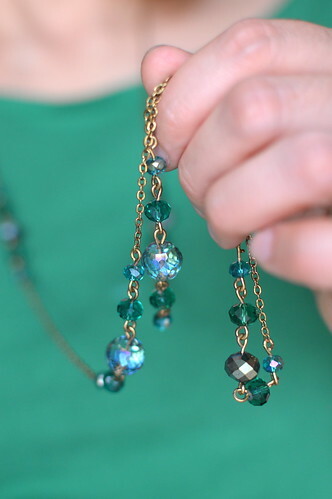 Today, I’ll tell you what I did with those five necklaces and how it seemed like a lot necklace bits to work with, but ended up being just right. 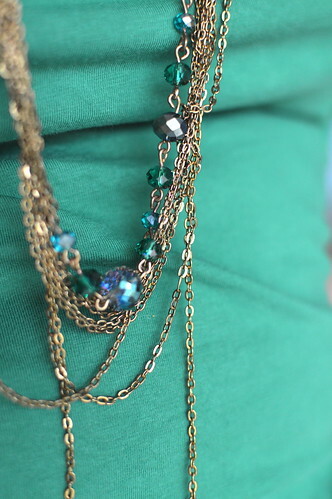 Let’s start with the ugly photos of the necklaces in a tangled mess fresh from the shop. They were all in one big plastic bag. Five necklaces tangled together like I’ve never seen before. 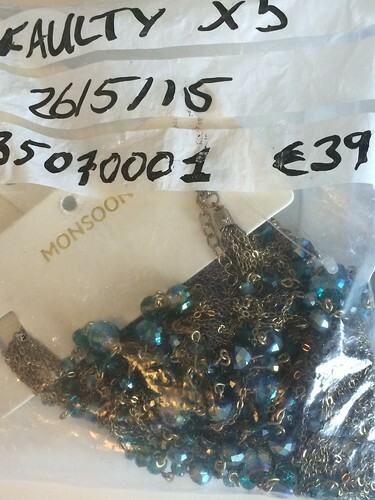 The retail price for each necklace was €39 so had I bought five necklaces for the original price, they’d have cost €195, but no way anyone would pay that for this bag of messiness so they priced the bag at €2.50. The real glass beads alone made it a worthwhile buy. Spoiler alert: I made FOUR necklaces out of these tangled brass/glass necklaces. I gave one to my friend Heather because she admired it. These photos are not great because my DSLR was charging that day and I photographed everything with my phone which had toddler fingerprints on it. I suppose it will just make the after photos look even better! Now, for comparison, this is what the necklaces looked like on the shop’s website and at Monsoon HQ where they were styled by the people who knew how they should be worn. These images were grabbed from the Monsoon website before the item sold out and was taken down. I’ll admit that in spite of my best efforts, I never got the necklaces to look like this. 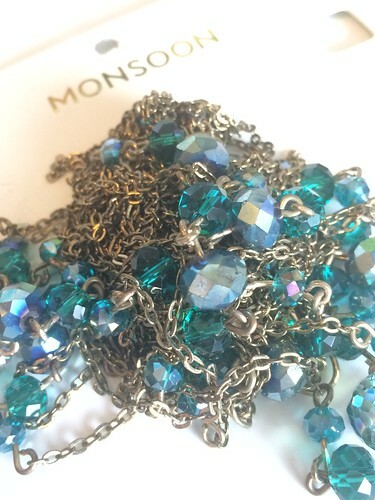 They were so badly tangled and even missing some of the brass chain lengths in some cases so, even when I reassembled the necklace to look like it would in the Monsoon photos, the various chain lengths never were the same. Oh well. So, on to how my efforts paid off in other ways and how I turned that mess into wearable beauty. The tangles were made impossible because the various sizes of glass beads with little brass links between were like the hooked ends of an anchor, grabbing ahold and not letting go. So, the only way to progress with this mess was to carefully remove all the glass bead segments from the brass chain lengths. I did this with jewellery needle-nosed pliers. 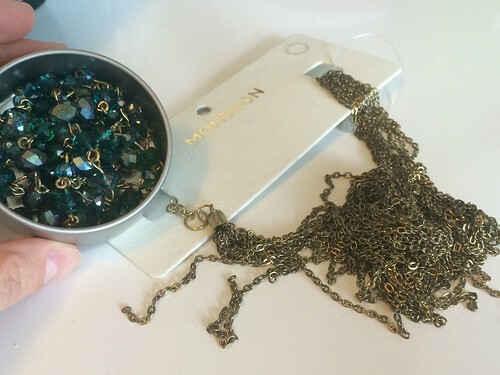 Once I removed all the glass segments from what I thought was one necklace, a complete necklace chain was freed so I could see what I was dealing with. So many beautiful little glass beads! 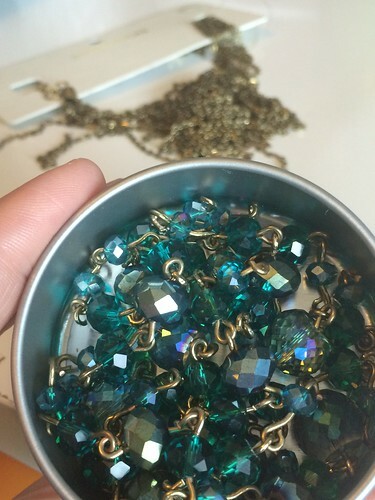 The brass chains were untangled carefully from the one freed necklace and I could see how it should be. I set about trying to recreate the necklace from the Monsoon website and came fairly close. I loved how the necklace looked. In the end, two of the necklaces were reassembled like this, one for me and one for Heather because I was wearing the first one I fixed when she showed up for girls’ night in capri pants that matched the beads so perfectly I knew she needed to own the necklace. So, I gave it to her. And, as I suspected, it suited her perfectly. Yay! I know had I kept it, I’d have just thought about how she should have it and ended up mailing it to her in the States, so really glad decisiveness saved me that international postage. Ignore the lint and stain on my tee-shirt. *shakes head* I admire the mothers who manage to keep their clothing clean and stain-free. If you’re reading this, tell me your secret to accomplishing that? The beads are beautiful and just far enough apart to really shine. I ended up having enough supplies, so I made two of these necklaces. 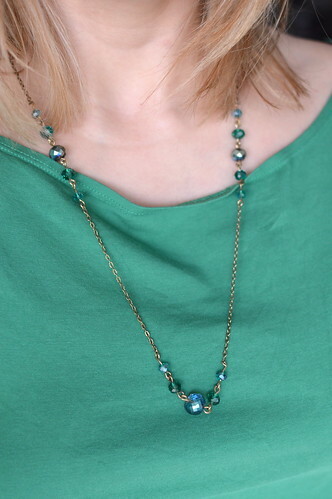 I didn’t really need or want another three of the same necklace, so I decided to try a “Tin Cup” (chain lengths between the beads/pearls) approach to create two other necklaces with the spare necklace parts. One of the “Tin Cup” necklaces was short, just long enough to slip over my head, while the other was long enough to put over my head and double-up. I didn’t use the larger sections of brass chains or the clasps for either of these. Three of the necklaces were so badly tangled I could only use them for parts (the clasps and main chain lengths remain a mess in spite of my best efforts), so having used up all the smaller brass chain segments, I was left with a bounty of glass bead segments and just connected those to create a VERY long necklace that can be put over my head three times for a chunky yet elegant look. Which of the Albany Necklace reincarnations is your favorite? Do you think they named it after Albany, NY?